Initiated by the ANIMA Investment Network and the CIHEAM-IAMM (International Centre for Advanced Mediterranean Agronomic Studies – Mediterranean Agronomy Institute, Montpellier), the Lactimed programme has just completed its first three years of work. Designed to organise the dairy industry in the Mediterranean, the programme has carried out 150 different initiatives and five dairy industry assessments, involved 104 SMEs, identified 27 investment opportunities and 28 agri-tourism activities and initiated eight cluster projects. "Over a period of three years, the programme has worked to increase the production and improve the distribution of typical and innovative dairy products within the Mediterranean. It has helped set up industries locally and finance companies looking to innovate," notes ANIMA Investment Network representative Emmanuel Noutary in a report detailing 37 months of work in five pilot regions*. 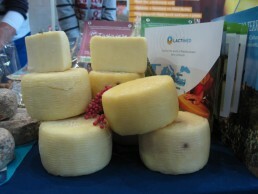 With 90% (€4.35M) of its funding coming from the EU's ENPI CBCMED programme, Lactimed drew up a detailed study of the local dairy industries that served both as a foundation for drafting a development strategy and as supporting evidence in increasing public authorities' awareness of the need for more support. This study revealed recurring issues: "… lack of infrastructure. Food hygiene issues prevent access to national and international markets. Food processers suffer from an irregular supply of milk. The badly adapted financial tools (small producers have no access to private bank funding) hinder the modernisation of production means." The programme's two carriers provide solutions to these sticking points. For example, the introduction of clusters is providing an initial answer, in particular through the pooling of resources and skills. Thus, in Tunisia, two clusters –one for cattle in Bizerte, the other for sheep in Béja- have been set up to improve milk quality and provide access to bank financing. The participation of the Banque Nationale Agricole has led, among other things, to the creation of two innovative financial products that provide easier financing for the 153 dairy farmers and milk producers. In addition to promoting the products (the usual dairy product weeks) and training (246 participants), Lactimed has also capitalized on its competition for innovative projects, launched in 2014. Each of the 10 winners received €10,000 in aid together with technical and marketing assistance.